I had pretty much given up hope on pulling ivy in part of our back garden and resigned myself to just making it look halfway decent with garden accents. Then, last year a neighbor gave me ten shutters and I made two raised garden beds from them. 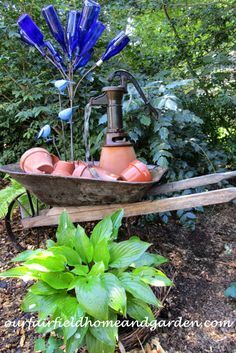 It really worked, a way to garden even in a fifty-year-old ivy bed! I was hooked! So, last fall the whole area was weed whacked and smothered in mulched fall leaves from the mower. This spring, the ivy was mostly at bay and I started to dream of another garden. Serendipity! 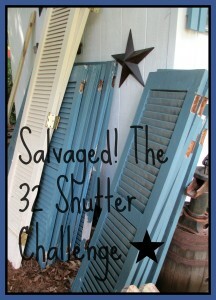 Another neighbor offered me their thirty-two old wooden shutters and The 32 Shutter Challenge began. 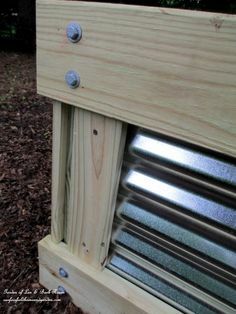 We built a raised garden bed from wood and corrugated metal roofing panels. 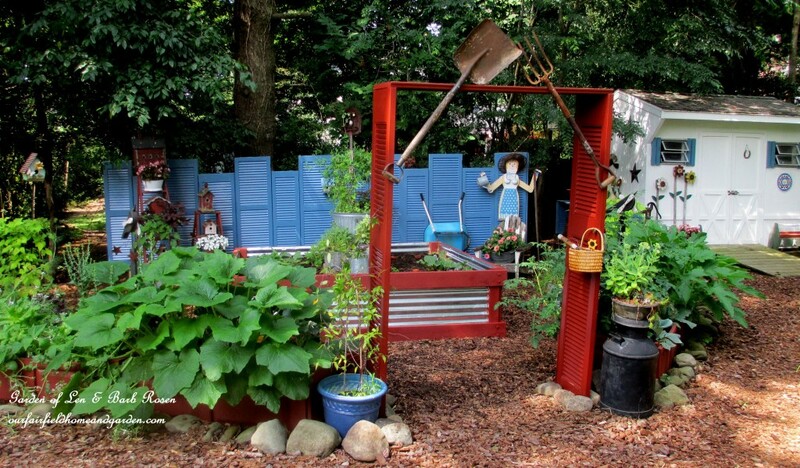 Eight feet wide and long, this garden eliminates the problem of tree roots and poor soil! 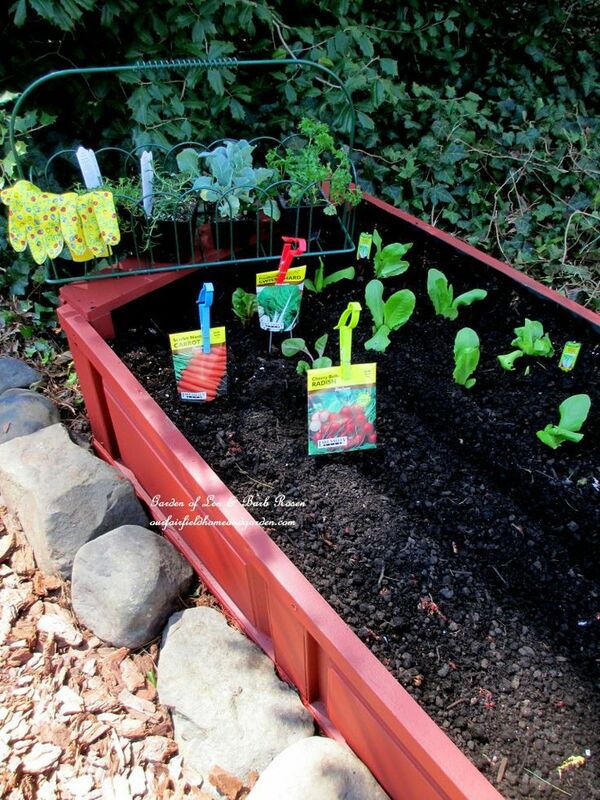 Click on the raised bed to get all the particulars. 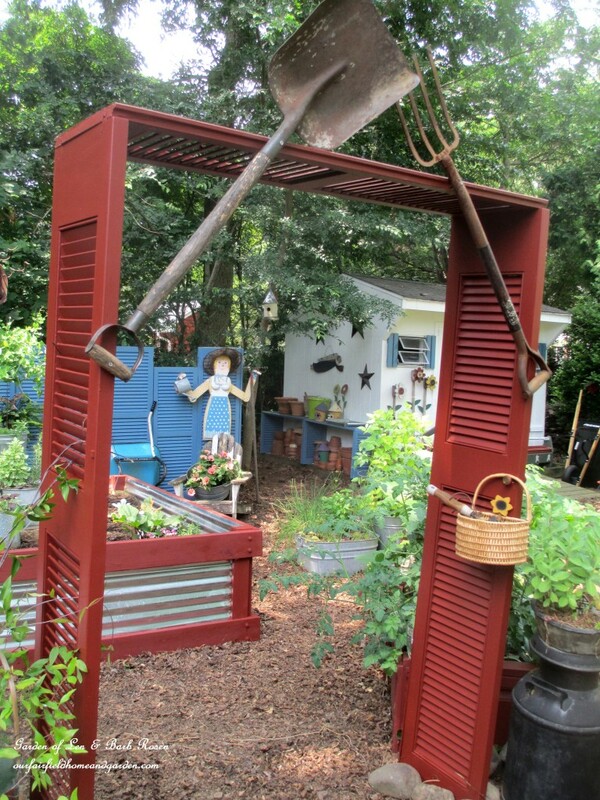 Three shutters now function as the garden arbor entrance. 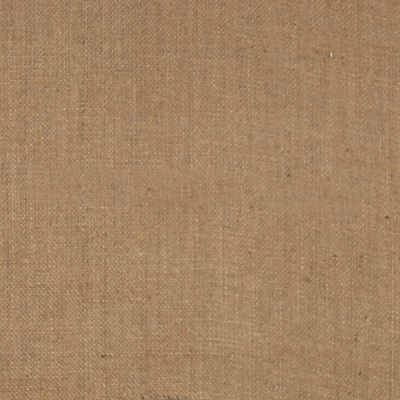 Click on the arbor to get more information on its construction! 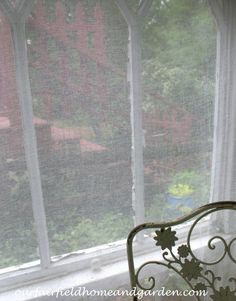 Fourteen of the shutters became The Shutter Garden’s fence. To see how it was put together, just click on the picture below! 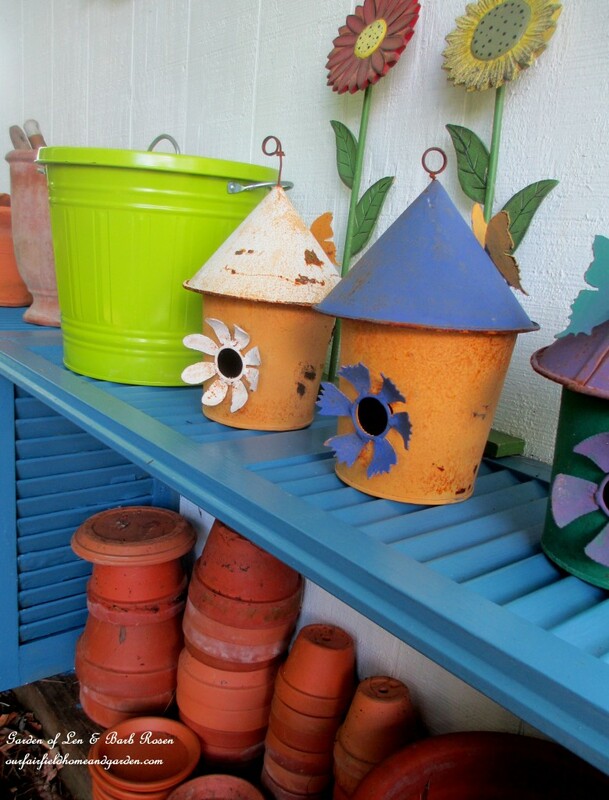 Dress the fence with birdhouses, garden tools and planted containers! 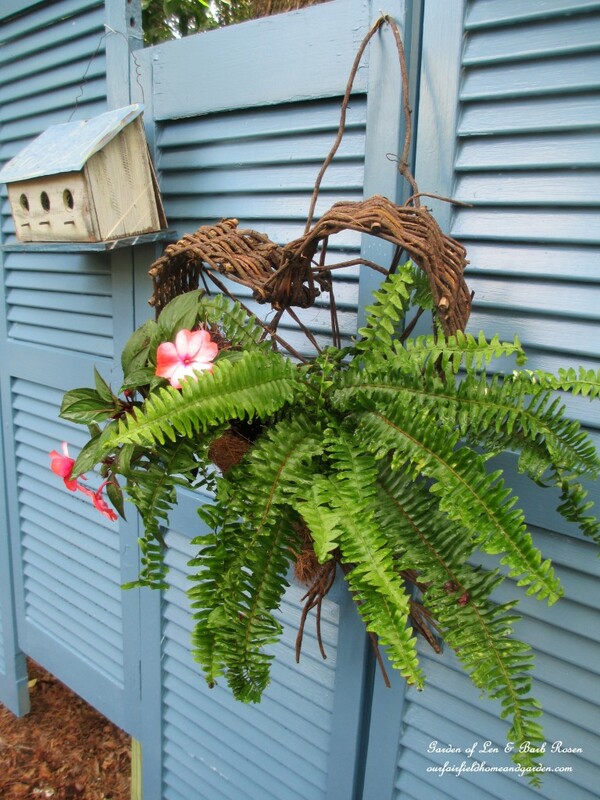 The finishing touch was putting together a potting bench using four of the shutters. Click on the picture to get more details and see how it was made! Here’s the “Before” picture, a huge patch of English ivy and the first two raised beds repurposed from shutters. The “Before” picture ~ a huge patch of English ivy! And, the “After” picture! 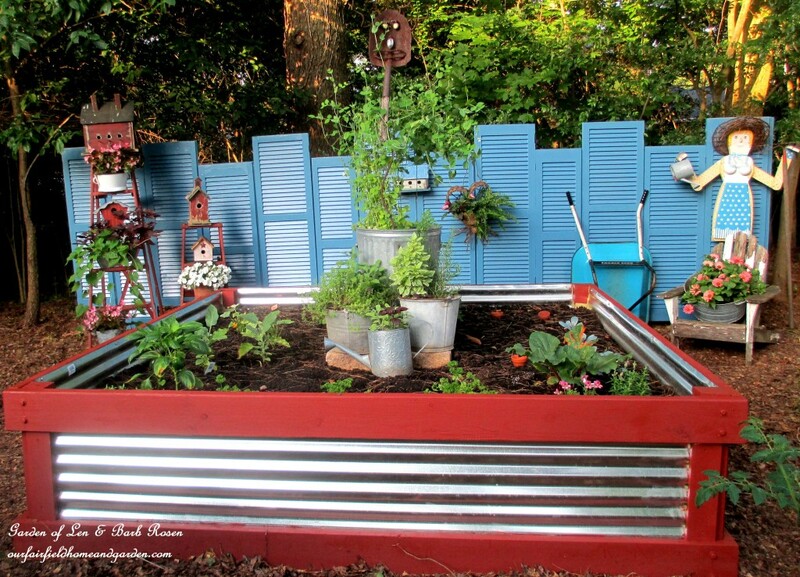 Here’s The Shutter Garden with all the pieces put together! From a huge bed of ivy to a vegetable garden! 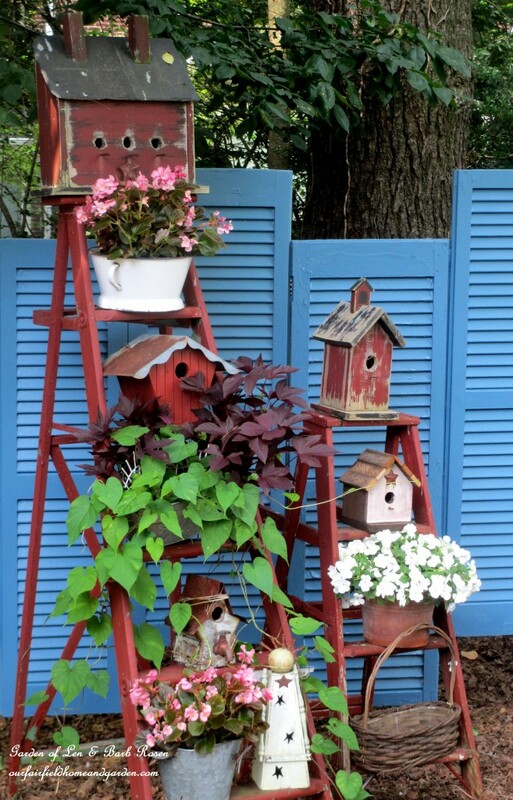 Birdhouse Ladders dressed up with vines & flowers! A wonderful sign painted by a dear friend says it all! 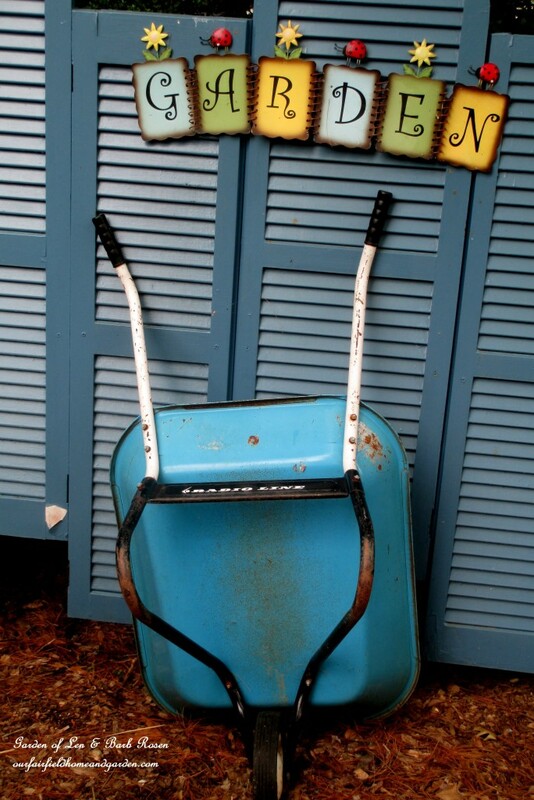 Garden sign and wheelbarrow at the ready! Love, Love , Love all of it!! Great job with the shutters!! So much inspiration!! Red, white, & blue, just in time for the Fourth…Looks great Barb! 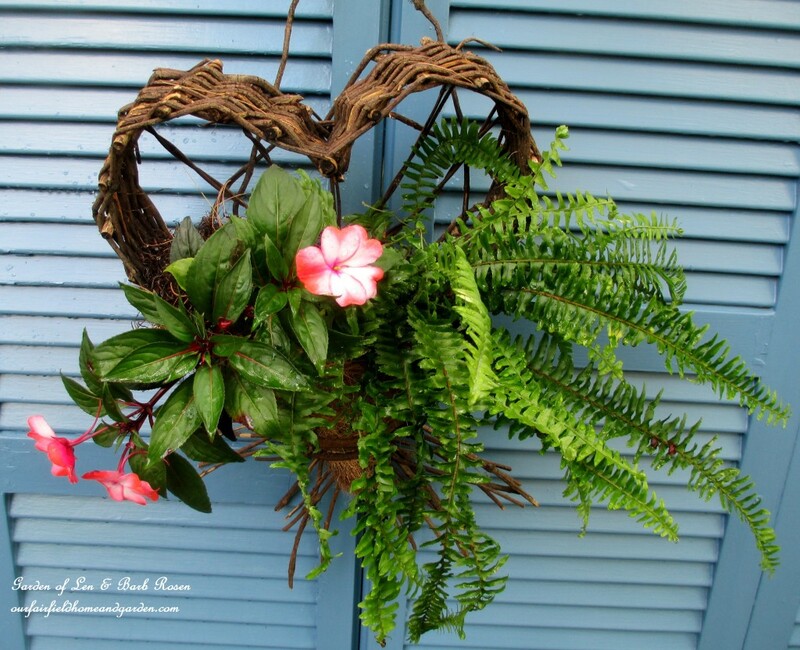 I love the pop of blue shutters in the background! I wish I had neighbors that threw good stuff out! They look great….good job! It was great that most of the shutters were already blue, Christine! I had leftover exterior paint from painting our house last year that almost matched! I love a bit of blue in the garden. 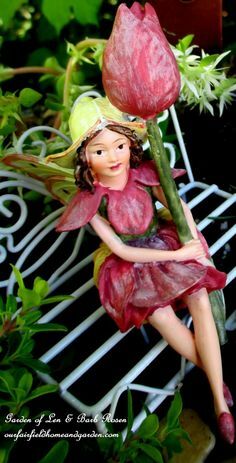 Your garden is chock full of charm and whimsy! And what an impressive collection of shutter projects! I hope it makes you smile every day! Thanks, Sharon! I am enjoying my new Shutter Garden very much! It was a thrill to get rid of all that ivy, too! 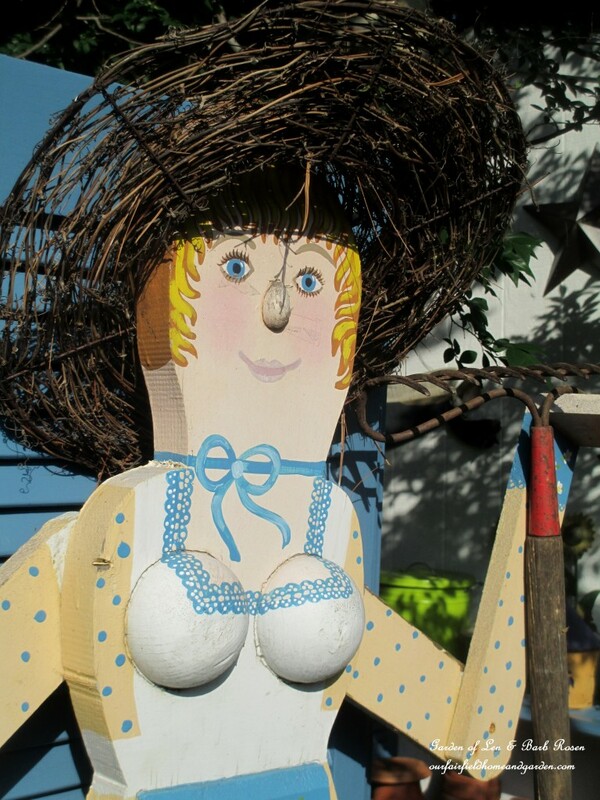 I’m with the garden lady on this one and smiling just as wide! Love that shutter wall – lucky you to get hold of all those shutters! I am quickly getting the reputation of neighborhood “Junk Lady”, Kelly! Folks call me up to offer cast-offs and tell me about something put out on the curb! That many shutters at once was amazing! Wow, you’ve been busy. Great use of the shutters. 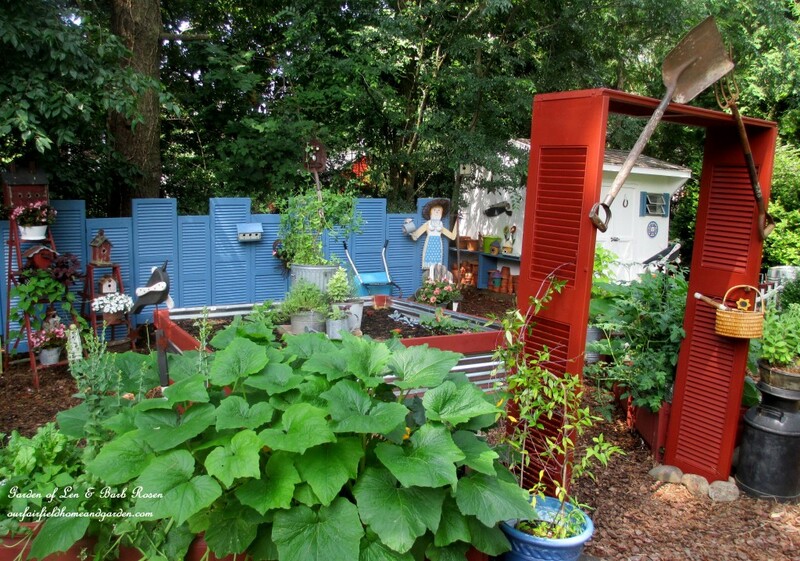 I especially love the blue fence. Thanks, Margaret! Sure glad you took a look at my projects! I love your creativity! 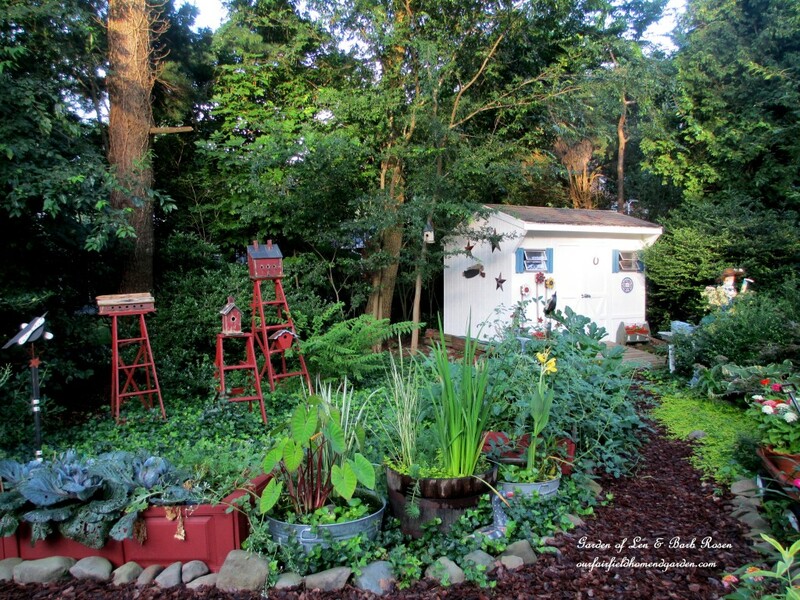 Some people see junk – you saw a whole new garden! Excellent repurposing for those shutters Barb. 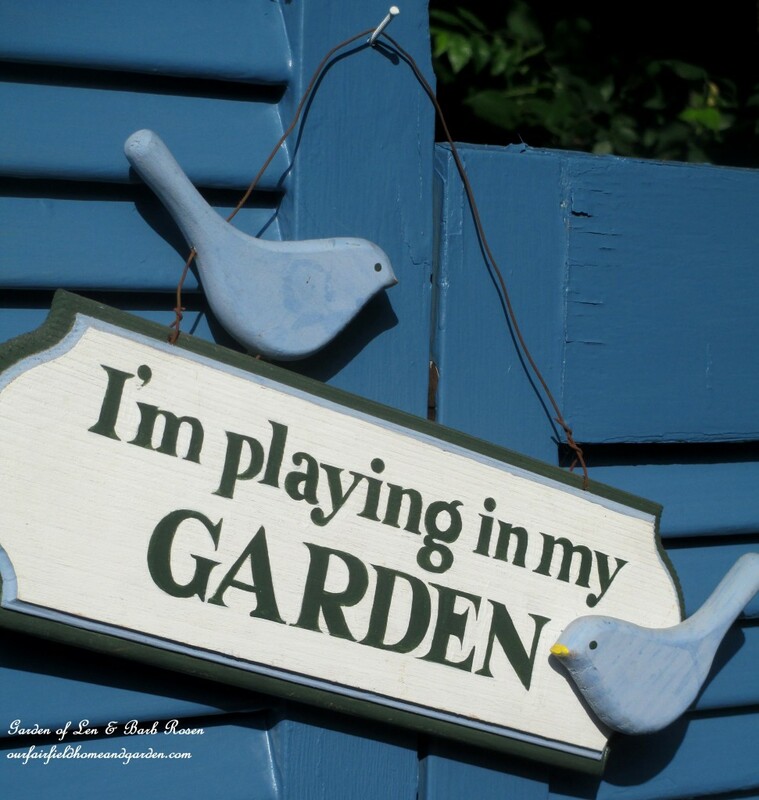 Keep up the good gardening! And thanks for sharing! 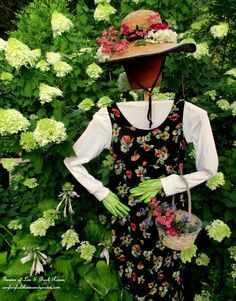 I love what you do with all the recycled items. Thanks, Isabella! 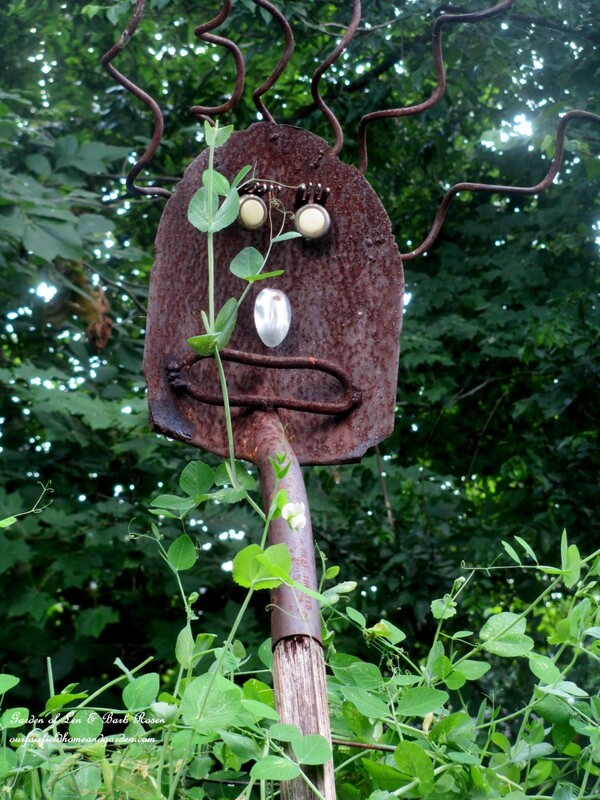 It is a lot of fun thinking up ways to repurpose items to keep them out of the landfill! What fabulous art!! How do you keep the plants on the ladders from the wind blowing them down. I have used my Dad’s old step ladder in my veg. 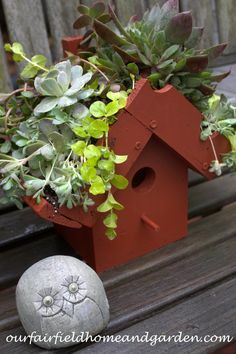 garden for years with a bird house I built on the top. I hold the ladder by stakes to keep the wind from taking it. Hi, Linda! The pots are screwed onto the ladder steps to keep them from blowing off! Sneaky, Huh?? My ladders are staked as well.